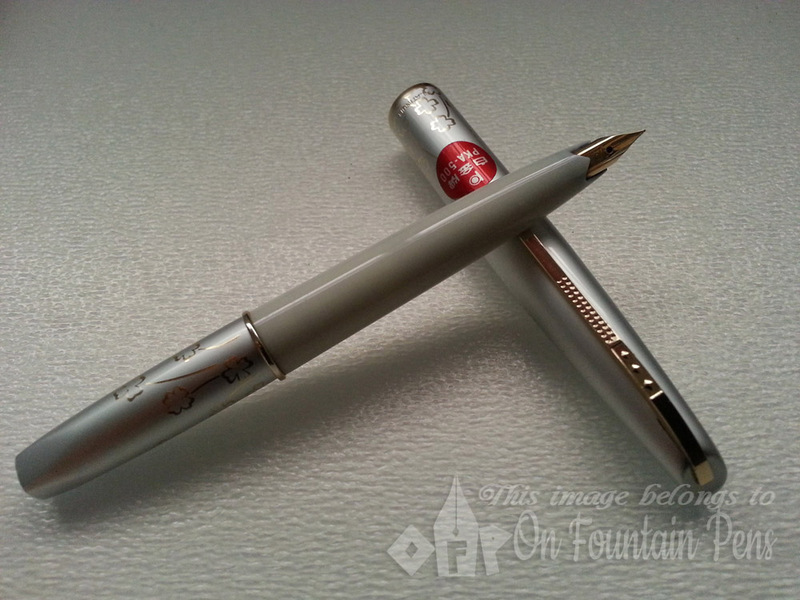 On Fountain Pens » Platinum: PKA-500 Pocket Pen – from the 1970s! I am actually writing this quick post in a huge rush – I’m flying off to Vietnam for a business trip (with extra fun on the side after all the meetings!) in a few hours, and I do need to get some sleep before going to bed. I could have gone to bed, like, right now, but I am so excited and eager to share with everyone about this new pen that I received, thanks to a nice friend, that I absolutely have to blog immediately. 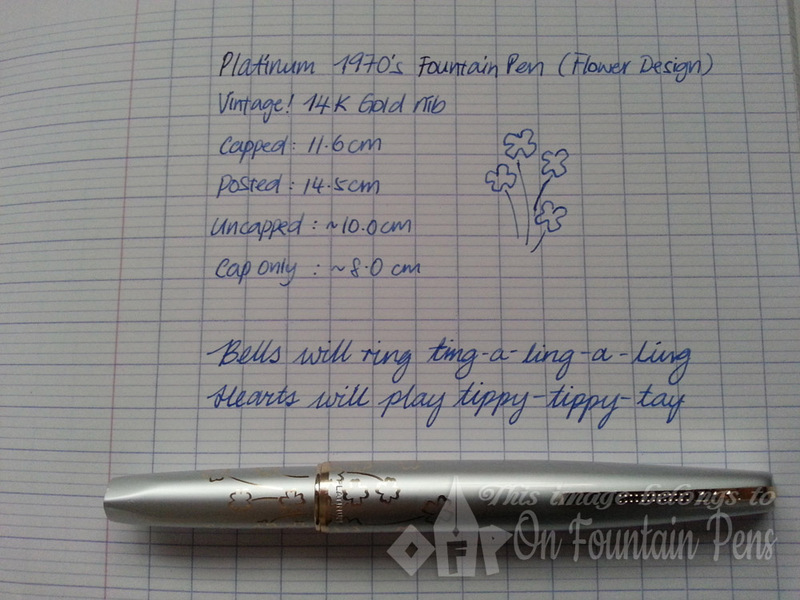 The Platinum Pocket Pen, with flowers, from the 1970s! As you might see, I had no time to adjust the quality of the pictures, nor add my watermark, nothing. This is how excited I am about this pen. This is a Platinum Pocket Pen, or a “Long-short pen” if you prefer (this name always makes me laugh, what an oxymoron). The model is probably that imprinted on the red sticker – it says “PKA-500”. It’s a pen produced during the 1970’s, when this design got really popular. There are many similar pens with this huge-cap/small-barrel feature from makers like Pilot and Sailor. I doubt they actually sell or produce such pens anymore, which is why I am so excited about it. I browsed the web quickly on this pen and could not find many sellers of this exact design, however I did see a couple of the full-black body type. 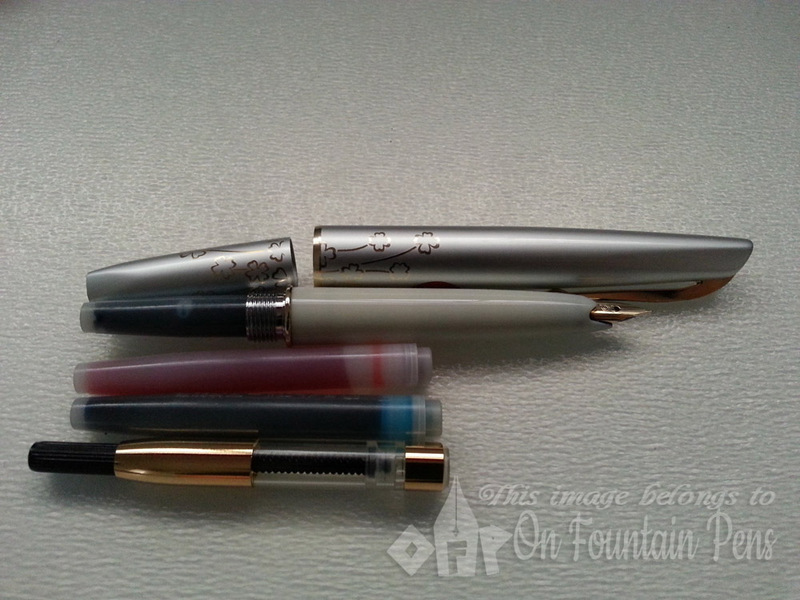 This pen is really adorable as it is small, light, glossy and elegant. A very “ladies” pen which normally wouldn’t appeal to me, but this particular one screamed out for me to be its owner, so I couldn’t resist! 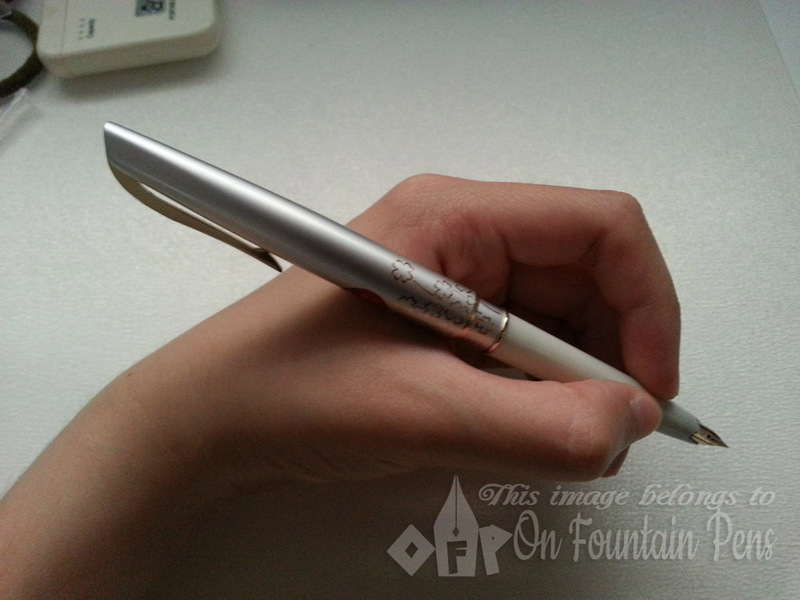 The flowery design is present but not striking, it quietly adds a very pretty and gentle touch to the pen as a whole. The nib is a 14K gold nib, writes fine and pretty smooth. As usual, being a left-hander I often have to smooth out the nibs on my own, and I did the same for this, which took only a minute. 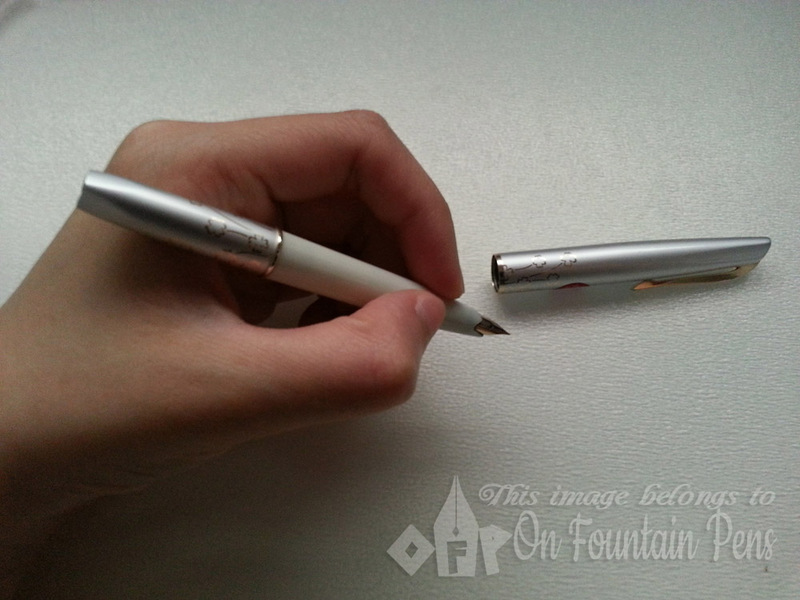 There is a little “P” engraved as well on the nib, indicating the brand of the pen, “Platinum”. It’s such a tiny nib, and really cute, just like the pen! Sorry guys, the photo is a little dark. 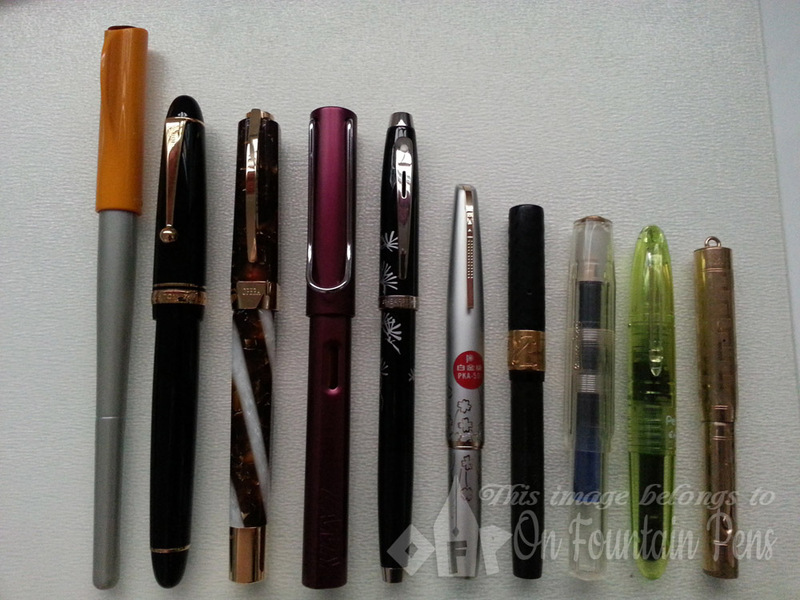 But I guess you do manage to spot the pens, from left to right: Pilot Parallel, Pilot Custom 742, Visconti Opera Elements, Lamy Al-Star, Sheaffer 3 Friends of Winter, The Pretty Platinum Pocket Pen (some alliteration there), Waterman 52 1/2V, Kaweco Sport, Pilot Petit1, Wahl Ringtop (with the exception of the Lamy Al-Star, I haven’t yet reviewed all the other pens. This goes to show the rate of my pen collection expansion being inverse to the rate of my blogging – what a sad fact!). So the Platinum is actually of a pretty decent size, it is what I would call a “medium-length-bordering-on-the-mini” type pen. When I uncap it to write, it is actually just right for my hand without having to post it. However, posting the cap is also fine, as it becomes more the length of a normal-sized pen. Look at the two pictures below. Does its elegant petite-ness enhance the appearance of my ugly left hand? 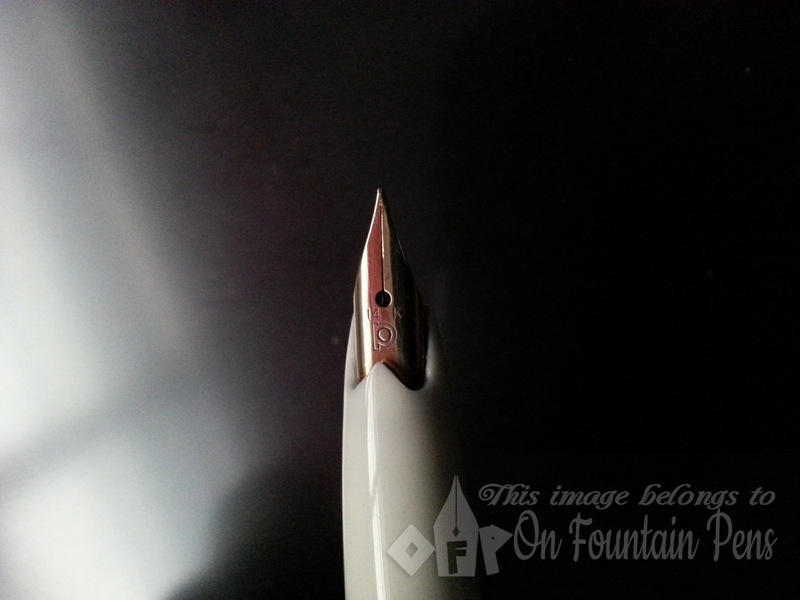 Now that I’ve talked about the nib and the appearance, let’s talk about the filling system. I couldn’t imagine how to place a filling system into this pen, but realised upon unscrewing the barrel that it actually can hold the regular Platinum cartridges! Yes you are right, the exact ones that the Platinum Preppy uses! With that I was hoping that the Platinum converter would fit as well, but it seems that it is a no-go. The converter is a little too long to fit in. I guess you might be able to try to get a sac-type converter to put into it, but if you ask me, I do not really like sacs as they are a hassle to clean. If you happen to be curious, that paper is Clairefontaine French-ruled paper. It’s great for fountain pen writing. Finally, I had been debating whether or not to peel off the red sticker on the pen. A poll with my fellow fountain pen folks on whatsapp encouraged me to remove it, and so I did. It left a little circular mark behind, though, but I guess it is due to the slight weathering of the rest of the pen body over the years. It doesn’t bother me so much! Probably will be less visible over time. What a nice little thing, the Pretty Petite Platinum Pocket Pen! Have you got one of these too? Thanks for the nice review. I bought a similar Platinum PKA-500 through Ebay. I like the lightness of the pen and the delicate but constant ink-flow, even upside down. This was a very good review of an interesting pen. I have an old Pilot Elite from the 1970s which is a great pen. 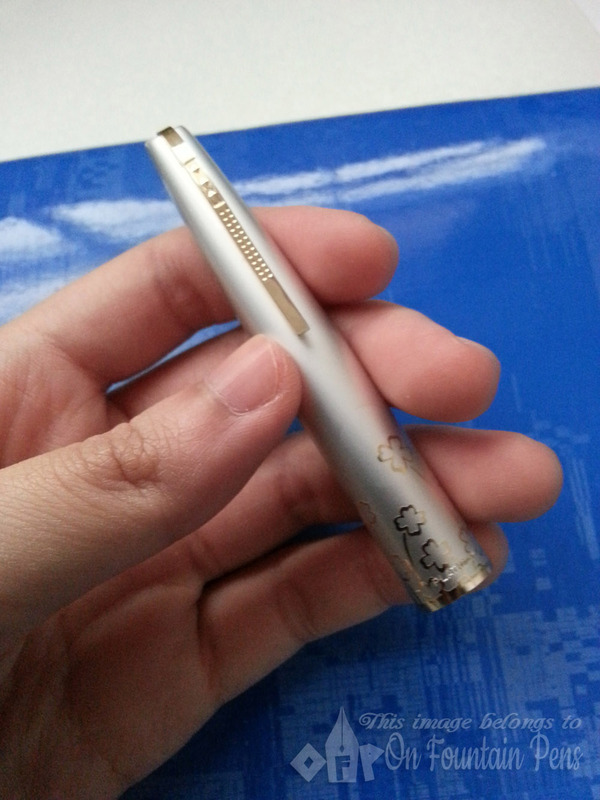 Can you please tell me if there is anywhere in Singapore that sells these pocket pens? Hi Chandon, thanks for commenting and Im glad you liked this review. Not sure where to get the Elites. I got this pocket pen from a friend. Are you some of the fountain pen facebook groups? You could ask about this there and see if anyone else knows. Are you from Singapore? Such a nice looking inexpensive pen. Just bought one on eBay. No winter flowers though…boohoo. Will see how it works out! Cool, let me know how it turns out! They still make pens like this. http://www.pen-house.net/brand/brand0061.html Scroll right down to the bottom and the PKR-2000, PKP-3000/5000 series pens. I dunno if they still have the exact design on yours though. Ooh, that’s some very nice information. Thanks for the link! Request for a review of the Kaweco Sport next please. Cute little pen and beautiful handwriting as well. Congratulations on this review. I would have kept the sticker, though. Hello Azizah, thanks for the comment, haven't seen you around for a long time! Pfft I see no ugly hand. I see cute hand and cute pen!!! Nice to see you back, even if just for a review before you rush off 🙂 Thanks for taking the time to do so! This is most adorable! I love little pens. And big pens. … I love pens. I like it. It's very sleek. 'Futuristic' even. And what ever it is that makes you think your hand is ugly I can't imagine! Indeed, it is an elegant ladies pen, in an elegant ladies hand.